Payrolls were up 242,000 last month and the unemployment rate held steady at 4.9% in another solid jobs report from the the Bureau of Labor Statistics. Job gains over the prior two months were revised up slightly, adding 30,000, such that the average monthly gains over the past year were well above 200,000 (223K, to be precise). The closely watched labor force participation rate ticked up to 62.9%, as over 500,000 entered (or re-entered) the labor force, another sign of improving conditions. Other signs, however, were more moderate. Average weekly hours fell by two-tenths of an hour, a significant drop, driven by the ongoing weakness in extraction industries (as well as utilities). Hourly wages, after adding a strong 12 cents in January, fell 3 cents in February (this is a common pattern with “high frequency” data–a strong month followed by a weaker one). The combination led weekly earnings to fall $6 (-0.7%) in February, though they’re up 1.6% over the past year. Factory employment, which added 23,000 in January, gave back 16,000 in jobs last month, as our manufacturers continue to struggle with the effects of the strong dollar, which make our exports less price competitive. More manufacturing sub-industries lost jobs than added jobs, and over the past year, factory jobs are up only 12,000–0.1%, compared to 1.9% for total payrolls. Overall, though, job growth is strong. 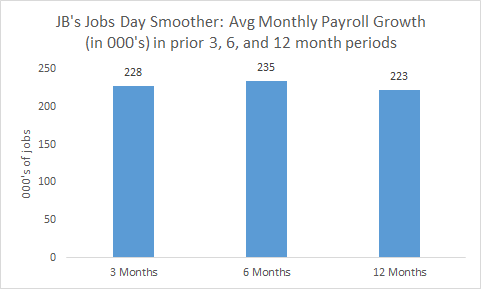 The monthly smoother shows average monthly employment growth over 3, 6, and 12-month intervals, and because the monthly pace has been so consistent, the bars are all about the same height. Even as the labor force is perhaps finally beginning to edge up a bit–one month definitely does not a new trend make–that’s still a good enough job-growth clip to further lower the unemployment rate, as long as the Fed keeps their feet off of the brakes. In another positive indicator, the underemployment rate, which had been stuck at 9.9% for the past few months, fell to 9.7% in February. This decline was not, however, due to fewer involuntary part-timers, the main group that has been keeping the measure of slack elevated, as that group held steady at about 6 million. It appears instead to be a function of fewer “marginally attached” workers. These are potential workers on the sidelines of the job market–not in, not quite out–and some may have jumped into the job market last month, helping to boost the participation rate and lower the underemployment rate. Despite February’s dip in weekly hours and hourly wages, there’s still some evidence that wage growth has been firming up in recent months. Averaging over the past three months, for example, hourly wages are up 2.5% over the same three months a year ago, a solid acceleration over the 2% pace of wage growth back then. This combination of over 200K jobs per month, faster hourly wage growth (these values are for average workers, but production/non-manager wages have accelerated as well), and low inflation has significantly boosted consumers’ buying power. It’s a Goldilocks job market–not too hot, not too cold–delivering real gains to working households without contributing to inflationary pressures. Clearly the Fed should stand pat, especially given the weakness in manufacturing, as rate hikes will increase the value of the dollar and further weaken the competitiveness of our exporters. Share the post "Jobs report: Solid jobs, moderate wages point to Goldilocks job market: not too hot, not too cold"
3 comments in reply to "Jobs report: Solid jobs, moderate wages point to Goldilocks job market: not too hot, not too cold"
All true, Jared, but take a look at the leading compornents of the report. Four of the 5 I pay attention to have either rolled over or stalled: temporary employment, manufacturing workweek, manufacturing employment, and civilian unemployment from zero to 5 weeks. Only residential construction employment has continued to rise. If it were just one indicator, OK that’s noise. But 4 out of 5? That’s cause for concern. Most of those are pretty useless. The ‘strong dollar’ is irrelevant. Most of that is utility based “manufacturing”. Guess what happens when that dies as commodity prices bottom? This report by the SF Fed suggests that we are closer to full employment than thought.